Want to Grow Faster? 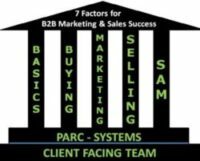 Focus On Your Clients First, Here’s Why. 1. It’s easier to sell more to your current clients first. They already trust you because they have already bought from you, and you are still servicing them. 2. Understand your current clients completely, before you sell to prospects. Then you can go after prospects that fit your ideal client profile. This will shorten your sales cycle, and also give you better clients. 3. Once you understand why and how your current clients buy, you can then get more business from them, because you will both be working on improving and growing both your client’s business and your own company. 4. This will also allow you to charge higher fees for your products/services going forward, because you will be able to sell ROI/COI to all of your clients and prospects. -Rich Williams | President – Firmwater Inc.